"All of Apple's new Power Mac G5s feature dual-core processors, but what it allows Apple to do is outfit the lower end Power Mac G5s with only a single processor and still offer the same number of concurrently executable threads as the older dual processor G5s. Granted you do lose some performance because the two cores now must share a single FSB, whereas the older dual processor machines had an independent FSB per processor. But any performance loss you'd see there is more than made up by the fact that each core now gets a full 1 MB L2 cache. "The previous G5 cores were stuck with a relatively small (by today's standards) 512 KB cache. It made the 90nm G5 die very small, but it also meant that performance wasn't as good as it could have been. One thing Johan found in his investigations with the G5 was that memory latency was pretty bad, and a small L2 cache does nothing to hide that. "For the two lower end G5s, the fact that the single CPUs are now dual core doesn't mean much, but the move to a 1 MB L2 cache per core should result in a tangible performance increase in a lot of scenarios. "Apple does give up a bit of clock speed at the high end by moving to dual core, with the fastest G5 now topping out at 2.5 GHz vs. 2.7 GHz. The larger L2 cache will make up for some of that difference, but not all. Obviously the high end G5 now offers more than just a faster clock speed...."
PR: If you're planning on attending Macworld Conference & Expo in San Francisco (January 9-13th) then pick up a complimentary exhibit hall pass ($45 value) courtesy of FastMac (no purchase necessary). e-ttache is a revolutionary portable case that can carry your computer components in one neat easily accessible package. No need to worry about set up as the unit is ready to plug the power cord in and simply push the start button. Users simply install their components into the case and lower the cover over the unit and then take their whole system with them. Super quality brushed stainless case. PR: Each day a number of hugely discounted products are temporarily made available through Apple's online store. Though the prices and products are excellent, navigating through the information can be difficult. A new website, Apple-Discounts.com, displays The Apple Store's Special Deals in an updated, convenient, and easy-to-read format to save Apple shoppers time and money. Product listings are updated daily at Apple-Discounts.com, so shoppers can see right away which product offerings are new. Apple-Discounts.com also offers a free downloadable Dashboard widget that displays the day's current-selling "hot deals" in both single and comprehensive formats. Or, if they prefer, shoppers can also receive a daily email with up-to-date information on the latest Apple bargains. All refurbished products available through the Special Deals section of The Apple Store are covered by Apple's one-year limited warranty, with extended warranties also available. Each day a number of hugely discounted products from Apple's online store are temporarily made available until they sell out. Apple-Discounts.com displays these current-selling "hot deals" in an updated, convenient and easy-to-read format, saving Apple shoppers both time and money. Now you can have all the Apple store bargains delivered to your desktop! The Apple-Discounts.com widget displays the day's current-selling "hot deals" in both single and comprehensive formats. PR: RadTech, makers of iPod and mobile computing accessories and more, today announced immediate availability of ScreenSavrz for Apple Cinema Displays, next in the series of elegant, formfitting protective covers for computer LCD panels, and StuffBak Device Recovery Service. 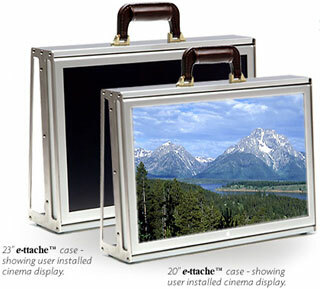 ScreenSavrz for Cinema Displays protect, clean and refinish Flat-panel LCD panels for total display care. Constructed from RadTech's unique Optex fabric, which is specifically formulated using today's most advanced optical polishing technology. Used as a display cover / protector, ScreenSavrz shield and protect LCD displays from impacts, debris and scratches. As a polishing medium, ScreenSavrz safely wipe away dust and thoroughly clean the surface of the screen. Dampened with water, ScreenSavrz possess the unique ability to remove light scratching and abrasions from LCD viewing surfaces. Non-woven and wrinkle-resistant, ScreenSavrz won't tear or fray and easily stow anywhere. ScreenSavrz for Cinema Displays are available in two colors: Titanium Grey and Aqua. Pricing starts at $38.95, and are immediately available for all Apple Cinema Displays. StuffBak is a loss protection service that recovers missing possessions, with a verified recovery rate of over 75%. Rugged StuffBak ID labels can be affixed to any piece of equipment - if something "disappears", the label allows the finder to return it easily - and get a reward too! One free StuffBak label is included with all RadTech web orders; additional labels are available for $1.95 each. StuffBak recovery labels are easily activated online. Once activated and attached to a device, the labels provide automatic protection. When an item is found, the owner is contacted immediately by phone and / or email. The StuffBak website can be used to report the loss and offer an extra reward. Finders are motivated to return lost property because StuffBak's system is simple, convenient, confidential, cost-free and offers them a reward. Finders simply provide the label number and we arrange for a courier to pickup or direct them to a nearby drop-off center. They don't have to try and find the owner, pack a box, or pay for shipping. Once the property is returned to the owner, they receive StuffBak's standard reward, $20 worth of StuffBak labels, plus any cash reward the owner has offered. PR: The FP202W's widescreen design provides more than 43 centimeters of screen width, allowing you to display and comfortably read two pages of text side by side. At the same time, the format preserves the display of content such as wide format notebook, DVD movies and games in their original glory without cropping or compression. The world's first 20" monitor to deliver an ultra-fast 8ms response time, the FP202W offers a superior gaming or movie viewing experience with its fluid video. Even fast-moving action scenes play back flawlessly with no ghosting or other visual defects. With support for resolutions up to 1680 x 1050 (WSXGA+), the FP202W delivers a crisp, crystal-clear screen image, further enhanced by Senseye™ Technology for ultra-realistic picture quality. And 600:1 contrast ratio ensures vivid color and exquisitely rendered details. With its clean, refreshingly simple looks, the FP202W complements any home or office decor, while the narrow bezel saves spaces and keeps the focus on the content displayed onscreen. The function keys, too, show the attention to detail lavished on this LCD monitor, with a visually appealing interface that is also extremely intuitive to use - including a hotkey that allows instant switching between analog and digital signal inputs. Input Hot Key- Switch between D-Sub and DVI just need one touch! I-Key for quick image auto adjusting. This product complies with Energy Star® Program Requirements for Computer Monitors. Version 4.0. Available in Q4 2005, at a suggested retail price of $649. PR: ATP Electronics Inc., a global manufacturer of digital flash media products, has announced the release of its rugged USB ToughDrive. The unique, road worthy ToughDrive is a high speed USB 2.0 flash drive that is stylish and functional, featuring a durable rubber housing that is both water and shock resistant. Available today, the ToughDrive family begins at 256 MB and offers capacities up to 2 GB, and can be partitioned and password protected for secure storage. ToughDrives also feature a high performance 30 MB/s data transfer speed for faster file transfers and seamless multimedia streaming. Tough enough for any mobile application, the ToughDrive is designed to withstand the rigors of everyday, in-the-field use in order to protect the user's invaluable data. It is the first ATP product designed with its proprietary DuraSkin construction. DuraSkin is a protective compound layer which completely encompasses all internal components, offering a second layer of protection against extreme temperatures, surrounding elements including airborne dust, particles, water and moisture, as well as shock absorption from accidental drops or impact. The embedded lines also make the ToughDrive extremely tactile and easy to grip while maintaining a slim, compact size storable in any pocket, case, backpack or bag. The ToughDrive data transfer speed of 200x or 30 MB/sec is designed for high quality multimedia streaming which yields less lag time for file transfers. Using the same high quality flash components as ATP flash cards, the ToughDrive also offers a read and write lifetime ten times longer than other standard USB flash drives. "Although USB flash drives are found everywhere in business and consumer markets, the need for data security and integrity in extreme environments is largely untapped," said Danny Lin, ATP VP of Sales and Marketing. "Data capture and transfer is pervasive in almost every computing application. However, when users are working with critical information in highly mobile, remote or severe conditions such as on the water, intolerable heat, high winds or altitudes, or freezing temperatures, data can not be compromised under any circumstance. The ToughDrive is the first flash drive specifically designed for the rugged market, giving mobile professionals the peace of mind they need to get the job done while in the field or in the office." The ATP USB ToughDrive will be available at retail locations like Microcenter and online at Buy.com, PC Mall and others in capacities of 256 MB, 512 MB, 1 GB, and 2 GB. PR: Macintosh computer owners will soon be able to reap the benefits of Sony's latest generation of DVD burners with the new Mac-compatible DRX-810UL/T model. The external double and dual layer DVD drive will begin shipping next month with Roxio's Toast 6 Lite for Mac compatibility. With the new DRX-810UL/T DVD burner and Toast 6 Lite software, Mac users will be able to store and share home movies, digital photos, and music at 8x maximum for DVD+R Double Layer (DL) recording speed, enabling them to burn up to 8.5 GB of video, data, music, or images on compatible media in about fifteen minutes. "This burner is geared toward Mac users and provides optimum performance and substantial storage capacity, making it an ideal accessory for the Mac mini or an upgrade for the eMac," said Bob DeMoulin, marketing manager for branded optical storage products in Sony Electronics' IT products Division. "The drive is also ideal for businesses deploying DVD video-based training and sharing large files as well as filmmakers creating prototypes on recordable/rewritable DVD discs before proceeding with mass replication." The drive also supports 4x DVD-R DL, 16x DVD±R, 8x DVD+RW, 6x DVD-RW, 48x CD-R and 32x CD-RW recording speeds. It also features a unique vertical design for easy placement and portability, and offers connectivity with both i.LINK (FireWire/IEEE 1394) and hi-speed USB (USB 2.0) digital interfaces for simple setup and maximum flexibility. Toast 6 Lite enables advanced authoring, copying and video features, and also includes the capability to create one-click copies of CDs, DVDs and disc images, as well as standard audio CDs. In addition to the Toast application, the drive comes bundled with a feature-rich software suite from Nero for Microsoft Windows. The DRX-810UL/T model will be available next month for less than $150. Sony DVD/CD rewritable drives are sold directly online through SonyStyle.com, at Sony Style retail stores nationwide and at authorized resellers, through certain mail order catalogs, and select online shopping sites. PR: RKL Digital Services has introduced a new and revolutionary touch screen kiosk digital media center offering any business a unique way to communicate valuable information about their company to the general public, increase sales potential, expand their customer base, and provide current and new customers with the ultimate in computer Touch Screen Technology at the touch of a finger. TouchTower™ integrates a host of extremely valuable features and benefits for consumers and retailers in one easy-to-use Apple Computer powered touch screen kiosk system. Touch-enabling allows users to transform the world's most innovative Apple Computer desktop into a customizable kiosk, mall directory, ecommerce terminal, virtual multi-list real estate book, personal communications device for Internet web browsing and email access, phone service and more. The possibilities are truly endless and unlimited. EchoFX, a Macintosh software developer, has announced the immediate availability of USBVision for Mac OS X 1.1.3 - software support for USB 1.1 video digitizing devices including the XLR8 InterView, Belkin VideoBus, iRez USBLive and CapSure USB, Hauppauge USB-Live, Dazzle Digital Video Creator, Pinnacle LINX, and others. Version 1.1.3 addresses a problem with audio-capable devices in the recent 1.1.2 release. In addition, the free USBVision Exporter software can now open many more types of files and has improved feedback during exports to iTunes/iPod video as well as other formats. USBVision for Mac OS X 1.1.3 is a free upgrade for all previous EchoFX customers. USBVision Exporter 1.1.3 is free. The USBVision software offers Mac OS X support for a wide range of devices including XLR8 InterView, Belkin VideoBus and VideoBus II, iRez USB Live and CapSure USB, Global Village VideoFX, Alpha Data USB Video Adapter, Hauppauge USBLive, Dazzle Digital Video Creator, Pinnacle LINX and many others - including those originally sold as "PC-only". The USBVision software also supports s-video capturing on some TV tuner devices including Hauppage WinTV and Pinnacle Studio PCTV. Additionally, the USBVision software will allow up to eight video capture devices to run simultaneously on one computer. Multiple devices can be used with Ben Bird's SecuritySpy and SubRosaSoft's HomeGuardian security packages allowing the monitoring of many different video sources. Multiple devices can also be used with video broadcast packages such as Vara Software's Wirecast, and webcam packages such as Econ Technologies' ImageCaster, allowing multiple video sources to be uploaded to the Internet from a single computer. The USBVision software has been enhanced in a number of ways from the original InterView-only software, including the addition of snapshot button support, audio input support, and increased compatibility with various third-party applications. The USBVision Capture software included, features hardware accelerated full-screen playback, duration-based recording and AppleScript support. The USBVision software is available for $25 per device activated. Customers who purchased the InterView for Mac OS X software or InterView Lite hardware from EchoFX may upgrade to the new USBVision software free of charge.